MADRID, Spain, May 12, 2014 (ENS) – Bird-loving tourists can help to conserve the birds that entice them far from home. This year, for the first time, World Migratory Bird Day is linking sustainable tourism with conservation of the 50 billion migratory birds now transiting their flyways around the world. Many migratory bird species are in decline, threatened by habitat destruction and degradation, illegal and unsustainable hunting, infrastructure development, climate change and disease. Flyways provide a framework for international collaboration and focus attention on the needs of migratory birds. Through the new Destination Flyways project led by the UN World Tourism Organization and introduced on World Migratory Bird Day, these long-distance traveling birds will benefit from tourism, when it supports local economies that can then afford to reject other, less environmentally-friendly sources of income. One of the eight sites selected for the Destination Flyways project is Lake Natron in Tanzania’s remote north near the Kenyan border. 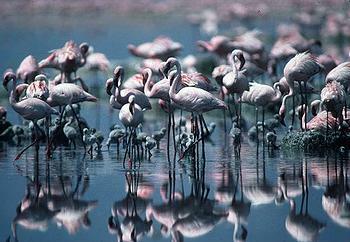 Inhabited by 75 percent of the world’s population of the Lesser Flamingo, Lake Natron is the only breeding ground for this species in East Africa. Since 2006, the Government of Tanzania has had an interest in mining soda ash at Lake Natron. But, local communities and environmental organizations in Tanzania and beyond have cautioned against the move, citing serious environmental, ecological and socio-economic impacts. BirdLife International, the Lake Natron Consultative Group and the Royal Society for the Protection of Birds have led a campaign against the proposal. For Lake Natron, tourism can be a conservation solution, provided that local communities are involved in its development and implementation and derive financial benefits from it. By providing an adequate framework for sustainable tourism management and diversifying the tourism offered along the flyways, Destination Flyways aims to generate revenue for improved management of biodiversity and spread the benefits of tourism to local communities, while creating attractive experiences for tourists. 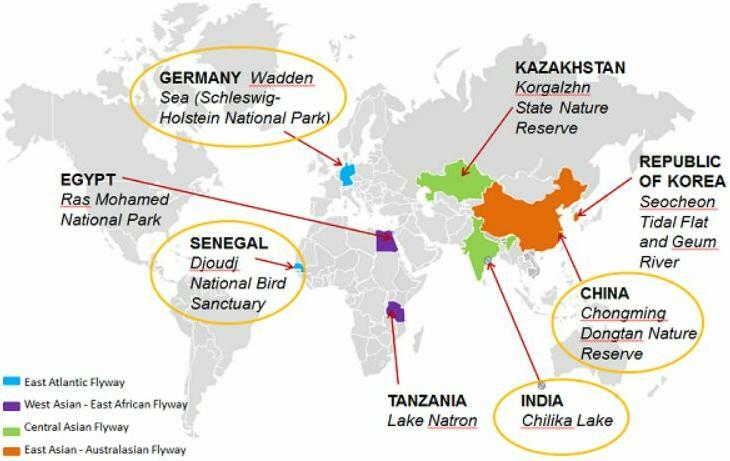 Along with Lake Natron, seven other bird sites and habitats in China, Egypt, Germany, India, Kazakhstan, South Korea and Senegal have been shortlisted for inclusion in the Destination Flyways project. “On this World Migratory Bird Day, we invite all to help us turn one billion tourists into one billion opportunities to protect the world’s original long-distance travellers,” said Rifai. Held every year on the second weekend in May, the World Migratory Bird Day this year was celebrated in more than 70 countries. The weekend leads to a year full of activities that support the survival of the 1,850 bird species that migrate from one location to another in a regular seasonal movement, often north and south along a natural flyway between breeding and wintering grounds. Dr. Hazell Shokellu Thompson, interim chief executive with the UK-based nonprofit partnership BirdLife International, says the tourism-conservation link is central to the way her 120 partner groups interact. “This year’s theme of Destination Flyways reinforces some of the key ways in which the BirdLife Partnership works, linking local communities to save sites, species and habitats in a coordinated way and enhancing local livelihoods,” Thompson said. The annual World Migratory Bird Day campaign is organized by the Convention on the Conservation of Migratory Species of Wild Animals, CMS, and the Agreement on the Conservation of African-Eurasian Migratory Waterbirds – two intergovernmental wildlife treaties administered by the United Nations Environment Programme, UNEP. “Many people want to experience nature when they travel and there are millions of people around the world who are particularly interested in observing birds in their natural surroundings,” said CMS Executive Secretary Bradnee Chambers. “Bird-watching is an important component of a global multi-million dollar wildlife-watching industry and provides a significant source of income and employment for a growing number of communities, especially in developing countries,” Chambers said. World Migratory Bird Day began in 2006 as an annual awareness-raising campaign. On the second weekend each May, people around the world take action and organize public events such as birdwatching trips, bird festivals, exhibitions and painting competitions. Eight Destination Flyway project sites along four of the world’s flyways have been preselected with partners. For each site, extensive data collection and identification of the way forward together with local partners are in progress. A proposal for the main phase of Destination Flyways is expected to be ready by mid-2014, with a potential project start in 2015. 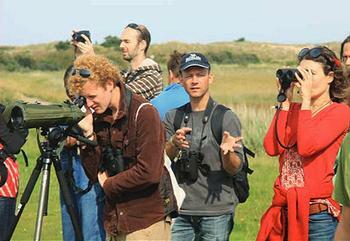 Both World Migratory Bird Day 2014 and the preliminary phase of Destination Flyways are made possible through the financial support from the German Federal Ministry of the Environment, Nature Conservation, Building and Nuclear Safety.